In Vietnam, people in families help each other. Grandparents help look after the kids. Towns and cities are very crowded and most people live in small apartments. Many Vietnamese people live in the country in small towns and villages. Across Vietnam, there are differences in the way people live, in different regions or in the city or country. Some things are the same though. Family is the basis of Vietnamese life, and it is very common for three generations to live in the one home - grandparents, parents, uncles and aunts, children. Respect is very important in the family, and the head of the household is the one who gets the most respect. Every member of the family works hard. The elderly members of the family help with child care while parents work. There are many ancient temples and citadels in many of Vietnam's cities and towns. The French influence is seen also in the wide, tree-lined streets and spacious public buildings and homes. After Reunification, these buildings were converted to government offices or divided into apartments for people to live in. There are now many modern buildings in the cities also, many of them large blocks of apartments to house the large population. About one quarter of the population live in crowded cities and towns. People living in the city work hard, at jobs like those of city workers in other parts of the world, in offices and shops, teaching or working in factories. Most families live in small, crowded apartments or in government housing. Some ground floor apartments have a courtyard or small garden, and some upper storey apartments have a balcony. Many people, both men and women, must work at two jobs in order to support their families. Grandparents generally look after the children while their parents work, but otherwise there are daycare centres for them. Children are expected to be obedient and show respect to their elders and to help around the house. Work starts at 7 am, but people start their day well before that, and the streets are busy with bikes, motorbikes, trucks and buses and cars, with people buying and selling food. Most offices close at 4pm, although shops stay open longer. Most families eat at about 6 or 7 pm. Many people then go on to another job or to adult classes to further their education or training. About three quarters of Vietnamese people live in country areas, in villages or small towns. Whether or not people live in the city or country, family is the basis of Vietnamese life. It is not uncommon for three generations to live in the one home. Respect is very important in the family, and the head of the household is the one who gets the most respect. Every member of the family works hard. In the north, farming villages consist of a group of houses with a temple or other building as a community centre and meeting place. In the south, villages are often along a central road and many are on stilts to keep above flood waters. There are government-owned farms as well as small private ones. Crops are rice, fruits and vegetables, sugarcane, tea or coffee. Some families raise livestock as well. Some farms are collectives, where family groups share equipment such as tractors, and the work and profits are also shared. Farming families all work in teams, men do the ploughing and digging of canals and other heavy work, and women work around the house and do the weeding. Younger people bring water to the workers and help in the vegetable garden. Everyone helps transplant rice seedlings into the paddies and at harvesting time. Older people look after the fruit trees and fish pond and look after the little children of the family. There is quite a variety of housing styles and materials in rural areas. Houses are often built with materials to hand, such as bamboo or mud, and now also cement or other materials. Some country houses have tile or tin roofs, but some are the traditional thatch, or roofing made of thick straw or palm leaves. There are some family compounds consisting of several rectangular brick buildings with open ground for drying rice, and shelter for farm animals. There are many villages, some with houses built close together, with narrow winding streets, and surrounded by fields for agriculture. In the past, villagers built thick areas of bamboo around the village to mark its boundaries, but this practice is disappearing. Most village houses are rectangles, with the door in the centre of one long side. Facing it is the family altar. The kitchen is on the side. Lowland villages have some sacred space, such as shrines or temples, including one to honour the village guardian spirit. Mountain villages are mostly of the ethnic minority groups, and often consist of thatched houses raised on stilts. Many of the houses have particular areas that are for an age group or gender, according to their traditional customs. There are fishing villages along the rivers and canals, generally on stilts. 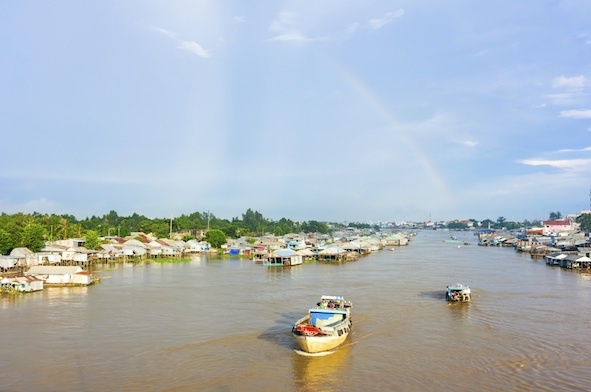 There are floating villages in Halong Bay and the Mekong Delta. These are often fish farms as well as fishing communities. In the past, farm people used the time after harvest in making handicrafts for their own needs. They were skilful and produced beautiful products. The techniques were shared within the village, but kept secret from others. In this way, some villages became noted for particular handcrafts or arts. Today there are some 1500 'handcraft villages', 300 of them noted for traditional arts such as ceramics and lacquerware. The government recognises and encourages them to preserve the country’s heritage. Vietnam endured many decades of war, and so education is enormously important as a way of recovering from that. Pre school is optional for children under six, however all children between 6 and 11 must go to primary school. All school students wear school uniform. Schooling is free, but families pay for books, uniforms and other school supplies. In country areas, it can be a struggle for families getting children to schools that may be some distance away, and at busy farming times such as seedling planting or harvest times, everyone is needed to help with the work. Rules are strict at school, but most students show their teachers the same obedience and respect that they show adults in the family. The school year is from September to May. Schools are cramped and not well equipped, and many do not have playgrounds. There are many children in Vietnam, and so schools are very overcrowded, so much so that they operate in shifts. Some students go to school in the morning for four hours, from approximately 7.30 to 11.30 am, six days a week, Monday to Saturday. A different group goes to school for four hours in the afternoons. Because of the short schooling hours, lessons are kept to the basics. All children are taught to read and write, and they study literature, maths, science and geography. They are taught traditional manners and customs, and respect for their elders, family and community. The school day starts with a test or quiz, with individual students asked a question. Lessons are learned by chanting. On Saturday the lessons are reviewed, and students each stand and tell the teacher what they have learned. Students are ranked first, second, third and so on. At the end of primary school, there are exams that decides which students go on to secondary school and which go to a vocational school where they receive training for specific trades such as agriculture or mechanics. In order to go to university, students must have attended and passed secondary school. There are also agricultural colleges that teach advanced farming methods, horticulture and animal raising. At every level of school, students are taught good citizenship and moral behaviour. At higher levels, they learn various philosophies (ways of thinking and believing) such as those of Confucius, a Chinese philosopher and teacher of around 500 BC, and Karl Marx, the 19th century founder of modern communism.